Since 1995, ILSI Europe has coordinated and participated in several projects under the European Commission’s Fourth, Fifth and Sixth Framework Programmes, and continues to do so in the Seventh Framework Programme and under Horizon 2020. ILSI Europe has been involved in iFAAM, Integrated Approaches to Food Allergen and Allergy Risk Management, an EU-funded FP7 project that was recently completed. ILSI Europe is currently preparing a post-iFAAM symposium on ‘Frontiers in Food Allergy and Allergen Risk Assessment and Management’, to be held on 18-20 April 2018 in Spain. This symposium will present the latest results from iFAAM, highlight the work of the ILSI Europe Food Allergy Task Force and identify research gaps still to be addressed. In addition to these running projects, ILSI Europe has been proactive in joining consortia formed to address ‘Horizon 2020’ calls and contributed to applications submitted to the European Commission. SUIT4FOOD – SustainablE Intervention technOlogies for controlling food Safety and Stability: a transnational, collaborative and multidisciplinary ERASMUS+ Programme. Liaise with governmental representatives from the European Commission, EFSA, WHO, FAO, US FDA, Health Canada and national authorities through our expert groups and workshops we organise within the frame of these projects. 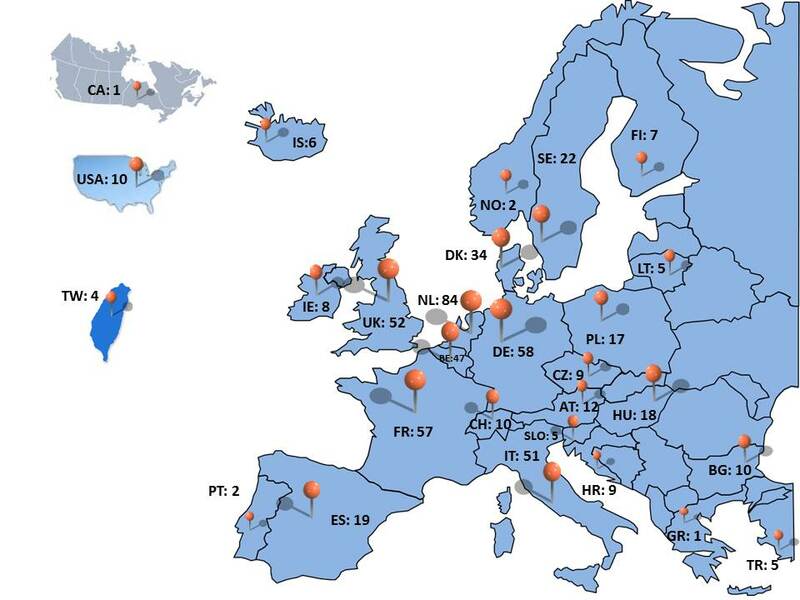 This map shows the number of scientists that we collaborate with through EU-funded projects. In total, EU projects expand our network to more than 800 scientists of high calibre. For more information about ILSI Europe’s participation in EU projects, please contact Dr Stéphane Vidry at svidry@ilsieurope.be or our Scientific Project Managers. To click on the link to read more about our Past Projects.